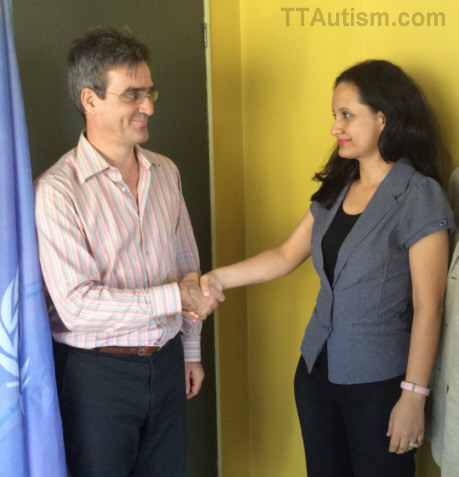 On May 5th, 2016, the President of the Autism Parents Association of Trinidad & Tobago, Mrs. Maria Borde, met Mr. Richard Blewitt, United Nations (UN) Resident Coordinator and United Nations Development Programme (UNDP) Resident Representative for Trinidad & Tobago, Suriname, Aruba, Curacao, and St Marteen. Present in the meeting was also Ms. Joycelyn Phillip, UN Theme Group Coordinator for Gender Equality, HIV and Human Rights. The purpose of the meeting was to discuss the serious issues of lack of public education and services available for families affected by autism in Trinidad & Tobago. Maria Borde shared APATT's mission with regards to access of free public services for individuals with autism in our country. Among many other topics, it was also discussed the UN Rights of the Child and the UN Rights of persons with disabilities that Trinidad & Tobago ratified in 2015. It was indeed a very informative and pleasant meeting. We would like to take this opportunity to thank Mr. Blewitt for meeting with us and for the valuable information provided.